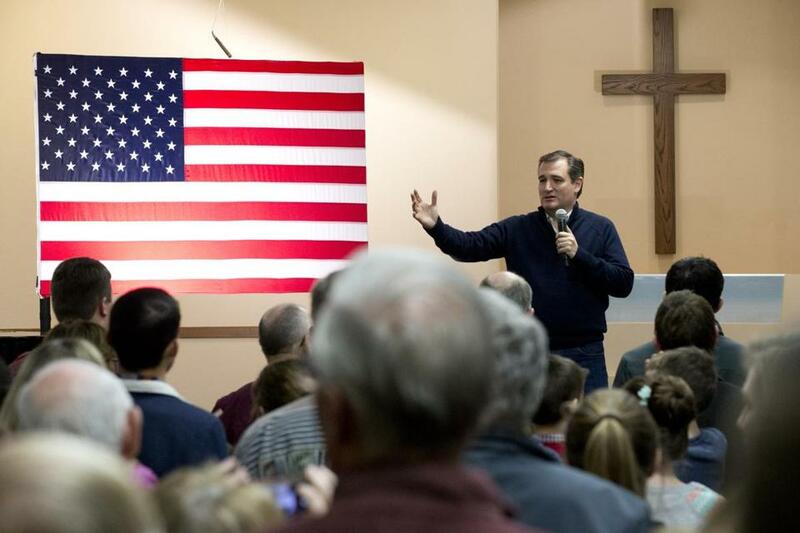 Senator Ted Cruz at a campaign event at Grace Baptist Church Monday in Marion, Iowa. Retail still works: Senator Ted Cruz’s come-from-behind win over Donald Trump put another helmet sticker on the Full Grassley. inspired by Senator Charles Grassley’s statewide tours. Cruz visited his 99th county on Monday, just hours before caucus sites opened. Unlike Trump, who traveled in his own jet and was rarely seen outside of crowded rallies, Cruz included traditional meet-and-greets at small-town coffee shops and yes, Pizza Ranch restaurants. His pitch in the final days of the campaign asked supporters to reach out to their friends and family and bring them to the caucuses. This is a positive sign for the future of the caucuses, which would be stripped of their essential character if candidates decided they could put the retail campaign out to pasture. E-victory: That’s evangelicals over ethanol. Cruz’s win came after the renewable fuel industry launched a bus tour against him and sent enough attack mailers to wallpaper my kitchen. Governor Terry Branstad even rolled up the welcome mat, saying he hoped Cruz lost because of his record of opposing renewable fuel mandates and subsidies. While the ethanol industry is important to the state, I thought it was inadvisable for the governor to put any special interest over his own pledge to remain neutral for the sake of fairness to candidates. At the same time, Cruz helped cement the already solid status of evangelical conservatives as the dominant faction in the Iowa Republican caucuses. As in 2012, more than 60 percent of GOP caucus-goers identified themselves in entrance polls as evangelicals. Cruz locked up some key endorsements, including Family Leader CEO Bob Vander Plaats and Congressman Steve King, to help consolidate support from Christian conservatives. Trump had some evangelical support but also was relying on mainstream and moderate Republicans. Young voters: Young voters had a major voice in the 2016 Democratic caucuses, as they did when Barack Obama won in 2008. Entrance polls showed 18 percent of Democratic caucus-goers were ages 17 to 29 and another 17 percent were 30 to 44. More than 80 percent of the younger group was supporting Sanders and a strong majority of the others. Voters under 44 also made up 28 percent of the GOP caucus, according to entrance polls conducted for the Associated Press and other media outlets. The parties have another chance to not only engage young voters in the primary campaign, but also to keep them involved in the general election. The question is whether either party can keep young voters interested after November. Polls: Speaking of polls, none of the ones published immediately before the caucuses, including the Des Moines Register/Bloomberg Politics Iowa Poll, nailed the final result of the caucuses. This doesn’t mean the polls were less accurate. What it does indicate is there was a lot of voter movement and changes after the polling was finished, including more people deciding to participate. The Register poll and others showed the potential for large shares of caucus-goers to change their candidate preference and many did. Caucus counting: For the second cycle in a row, a virtual tie between the top two candidates focused the spotlight on the vote counting and reporting processes used by the state political parties. Four years ago, Republicans announced the wrong winner on caucus night before all precincts had reported. Democrats did not make that mistake this year, but also could not report final results until almost noon on Tuesday. That’s despite the parties’ partnership with Microsoft Corp. to create the mobile app used to record and report votes. It’s too early to evaluate the fallout, but it’s safe to say there will be some. Stay tuned! Kathie Obradovich is The Des Moines Register’s political columnist. A version of this column was first published in The Des Moines Register and is part of an exchange with The Boston Globe intended to give readers an expanded view of the early presidential nomination process. She can be reached at kobradov@dmreg.com. Follow her on Twitter @KObradovich.